Existing homes resumed their upward growth path in March—the sixth increase in the past eight months. The National Association of Realtors (NAR) reported a 3.7% increase in existing home sales to a seasonally adjusted annual rate of 5.1 million units in March 2011, from an upwardly revised 4.92 million in February. While recovering only part of the 8.9% decline in February, the March numbers return existing homes sales back in line with the growth trend that began in July 2010. 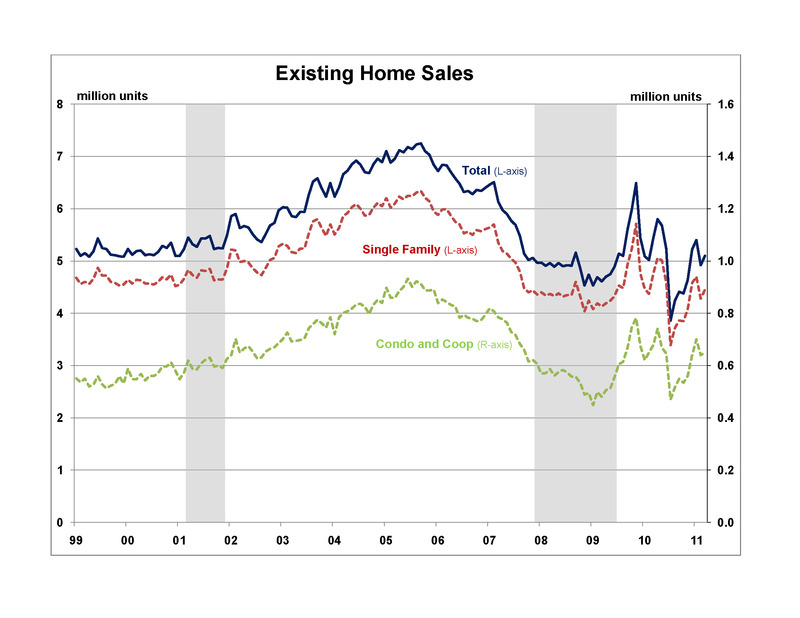 Overall, in the past eight months, existing home sales are up 32.1% from the July 2010 low of 3.84 million units. Despite the extended period of strong growth, March sales were still 6.3% below the 5.44 pace of March 2010, where sales were elevated by the homebuyer tax credit. Sales of single-family home were up 4.0% to 4.45 million units, while condominium and coop sales rose 1.6% to 650,000 units . Across the regions, sales growth was mixed, with strong growth in the South—advancing 8.2% to 1.99 million units, moderate growth in the Northeast—rising 3.9% to 800,000 units, and modest growth in the Midwest—inching up 1.0% to 1.06 million. Sales in the West decreased, slipping 0.8% to 1.25 million units. The turnaround in March was led by investors, with the investor share of sales rising to 22% from 19% in February. This reverses the decline in investor share in February (from 22% in January), which led to the decline in home sales. With the investor share rising, the share of first-time home buyers settled back to 33% and repeat buyers to 45%. Also associated with the increasing presence of investors in the market, there has been a steady increase in all cash transactions, which rose to 35% of home sales in March, up from 33% in February and 29% in December. It appears that investors are taking advantage of their cashed up position in the current market to purchase undervalued distressed homes, which they will either attempt to turn-over for a short-term profit or convert to rental housing. The NAR suggest that “With rising jobs and excellent affordability conditions, we project moderate improvements into 2012, but not every month will show a gain …” The NAHB agree with this assessment. The first quarter existing single-family home sales were in line with our forecast of 4.4 million units, but we expect the rate of growth in existing home sales to slow over the remainder of 2011, rising moderately to 4.8 million units on the fourth quarter of 2011.